An Alaskan cruise is the setting for amateur detective Sadie Hoffmiller's latest adventure. 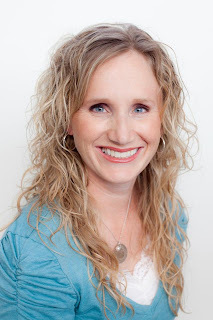 Sadie plans to spend time relaxing with her two grown children, Breanna and Shawn, and her boyfriend, Pete, while enjoying the luxury and cuisine of an elegant cruise ship and helping to plan her daughters upcoming wedding. But even as the crew prepares to leave port, Sadie has suspicions about the voyage ahead and the relationship between her normally easygoing son and a mysterious female passenger he obviously knows but refuses to discuss. When the woman is discovered unconscious during the second night at sea, Sadies apprehension escalates. Over the last few years, Sadie has developed an extreme dislike for secrets and it would seem her son is keeping one from her. *Includes eight new mouthwatering recipes, tested and approved by the official bakers of Sadies Virtual Test Kitchen. 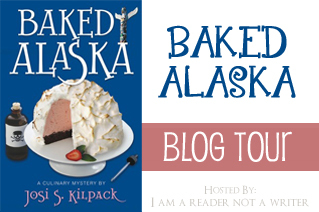 Josi Kilpack whips up another tasty treat for Sadie Hoffmillers fans. 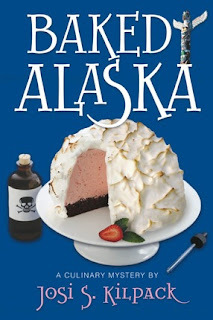 Baked Alaska is the perfect blend of humor and heart as we follow Sadie and her family on their newest caper. Sadie is looking forward to a little relaxation with her boyfriend, the distinguished Pete Cunningham, and her children. An Alaskan cruise seems just the thing for a little bonding time. But before anyone has even called "anchors away," strange occurrences pique Sadie's insatiable curiosity. When the ship leaves the dock, things become personal when her son, Shawn, is accused of a heinous crime. Determined to prove his innocence, the indomitable mother sets out to uncover the real culprits. When she begins to uncover the truths behind the passengers and her own children's odd behaviors, she realizes she just might be in over her head. In need of a lifeboat to help navigate the treacherous waves of deceit that threaten to capsize her happy life, she refuses to let even her own doubts stop her from helping her children. But so many questions need answering. Who is the strange woman Shawn was speaking to? Why does she end up in the hospital? What is her son hiding? Join Sadie as she uncovers clues to these questions and many others, all while sampling the divine cuisine around her. I love Kilpack's culinary mysteries. Sadie's antics always leave me laughing and shaking my head as I eagerly wait to discover how she will get herself out of the latest mess she's found herself in. This newest addition doesn't disappointment. Rife with danger, and brimming with touching moments between Sadie and her children as she learns when to help and when to let go, this mystery delves deeper into the heart of the Hoffmiller family. Sadie's reactions to Shawn's secrets and truths are touching and feel so real. Her conflicting desires to help her son, and solve the crime made me really ache for her. I felt Kilpack really captured the dynamics of a mother-son relationship, and dealt really well with the issues that often come up for both the adoptive mother and the child. Full of wit, humor, and intrigue, I couldn't put this book down until I had finished this newest chapter in Sadie's adventures. Oh, and I absolutely loved the surprise at the end. It had me squealing and grinning like a idiot. So romantic! I can't wait to read the next book to find out what the next step is for Sadie's relationship with Pete.